This is a painting I did in the Japanese Inks class I recently took at the DAA. This is an on-line school that teaches art using Painter by Corel. The class was a study of the philosophy of Eastern Art. In Eastern Art, the idea is that through a simple stroke, you tell a tale. One is to use minimal strokes in the painting. I took this class because simplicity is an area that I have tried to focus on in my art. It is so easy to overwork a piece. I know this is something I share with many other artists. It seems like I always want to add a bit here, a bit there, and the next thing I know, the piece is overworked. What I am learning is that if a brushstroke looks good, leave it. Don’t start putting the same brush stroke all over the painting. That ruins the “specialness” of the one stroke. In this piece, I did the tree trunks and branches with a particle brush. Particle brushes are made using math and physics. They are new to Painter. I had not liked most of them, as they are very hard to control. However, Karen Bonaker, the owner of the DAA, made us a spectacular particle brush to work with in this class. It literally danced across the page. Then for the flowers, I used another brush Karen had made for us. Just one stroke with it, and I get all kinds of blossoms. Karen had us put the trunks and branches on a different layer than the blossoms. 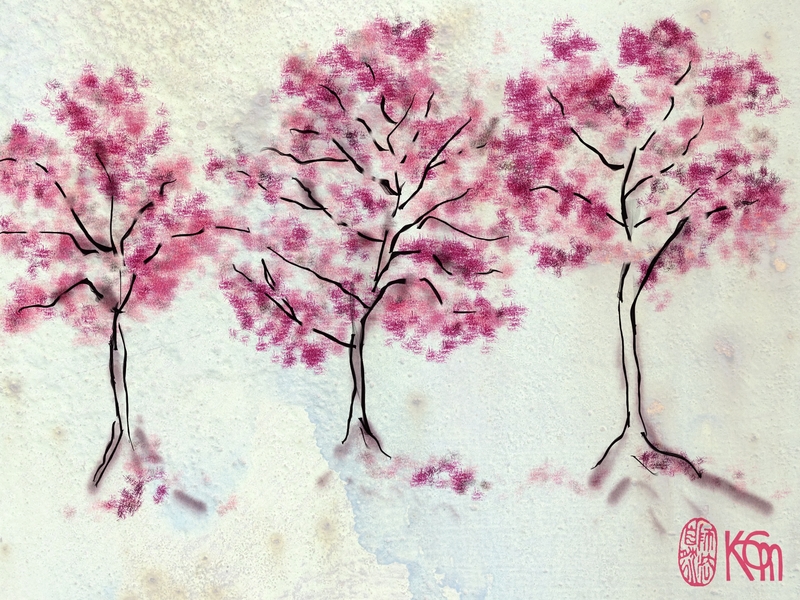 Then she had us go back after adding the blossoms and erase some of the branches in the trees. I found that breaking up the branches like that worked really well in giving the painting depth. I have mixed feelings about using brushes that other people make that then lay down that person’s strokes. I feel that every stroke in my painting should be my own. I usually stay away from brushes that make strokes that look like something. But I think I’m maybe becoming a little more open to them. Karen makes such beautiful brushes, they’re hard to resist. To finish this piece, I added a couple of textures to give it a background. I used the multiply composite method on the layer the textures were on to make them transparent. Then, on one of the textures, I added a mask to the layer and using a brush with dark gray paint, went in and muted some of the texture. When you add a mask to a layer, you then use black to get rid of something on the layer or white to bring it back. When you use gray, it leaves something in between. I am hoping this class has led me to start making fewer strokes in my abstracts. I need to get busy with some new ones and find out. (Not Japan, but an interesting story) I once took a course in Chinese art taught by a grad student in the Art Department at UMass-Amherst. She had been trained in China in the classic style. She was required to study calligraphy for three years before she was allowed to attempt a representational painting. The brush stroke is made quickly and then you move on. You’re right about the quick brush mark. I took the class to work on that and staying loose. If one doesn’t stay loose, then the one mark you get to make doesn’t look so hot. Thanks. Like your image and your blog. You make a good point about whether to use someone else’s brushes or not. In some of the classes I have attended, the attitude has been that each person’s strokes are individual and will therefore produce a unique result. That probably is true since the pressure and opacity used by each person can be very different, and with most brushes the similarities will not be that apparent. I guess the very unique brushes are the ones you wonder about. Thought-provoking topic! Thanks for your comments, Syd. This subject gives me a lot of thought. I LOVE this, Kerry. If I only had a room that coordinates with raspberry, I’d buy this in a heartbeat. Thanks, Carole. I wish you had a room that went with this. Warren got me to post this. I was going to pass on it. It’s done fantastically well on social media. Special – love the freshness of your painting Kerry! Hi Mary, thanks so much for your comments. I really appreciate them.